Tiki Taka is the latest restaurant to serve up the popular small plates pinchos and tapas of Spain, but spruced up for our local tongue with more Asian-centric flavours. A little bit of everything is always more enticing than a whole lot of one thing, especially when it comes to food. Banking in on the small plates and sharing platters trend, Tiki Taka at Medan Damansara is the latest restaurant to spring up offering the popular pinchos and tapas of Spain, but spruced up for our local tongue with more Asian-centric flavours. If its sleek handsome corner lot façade that greets you at first sight does not impress you, be assured that its warm laidback interior will. Both are befitting introductions to a colourful menu of small plates that tempts with items like salted egg crab bun, Nutella bacon and molecular paella. Creamy, rich, decadent and all the right amounts of briny, this is the perfect accompaniment to a whisky sour or a drink of the more tart variety. 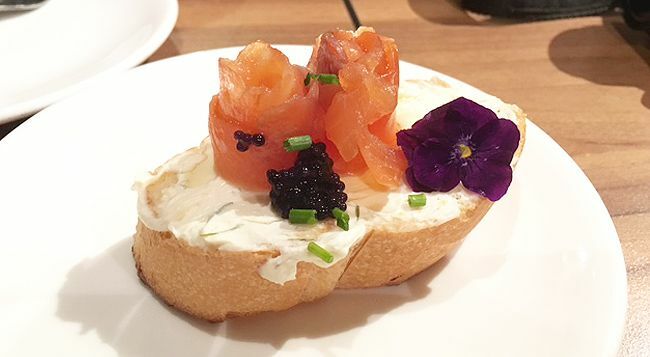 Springy smoked salmon is given an extra silkiness thanks to the blanket of dill cream cheese and injected with an extra intensity in sweetness courtesy of the black lumpfish caviar. Why have beef sliders when you can have crab sliders? Not just any crab, mind you. These come coated with indulgent salted egg batter, dressed in more salted egg cream sauce. Sandwiched between charcoal brioche, the fragrance of the salted egg yolk and crab spike excitingly when you chance upon the curry leaves and bird’s eye chilli. Fellow Nutella lovers, have we found the ultimate indulgence – Nutella is topped with caramelised banana, walnut, grilled bacon, truffle honey and blueberries for a treat that’s both sweet and savoury. The crispy bacon is as delightful as bacon comes before the hazelnut chocolate of the Nutella takes over for a sweet ending. For something with a little more bite, the saffron and squid ink pasta is a great confluence of contrasting flavours that still manages to come across harmonious. The winner is the saffron sauce that is refreshingly crisp despite its creamy texture, lifted further by citrus prawns, mandarin slices and a dash of Szechuan chilli oil. Rice never proved so exciting as with the saffron rice of this deconstructed paella. Roasted red pepper sauce, fried mini crab, paprika prawn ball and bacon gel seashell lend a mouthwatering sweetness to the saffron rice while candied citrus peel, lemon curd and parsley pearls keep things from becoming too monotonous with their sharp profiles. Desserts are an equally exhilarating affair with treats like Nutella bacon wantans, Ice Ice Baby (a refreshing bowl of mango sorbet balanced out by coconut ice cream, toasted coconut flakes and pandan palm sugar syrup and topped with buttered popcorn, crushed peanuts a fruit medley) and the good old classic churros. Pop by and be spoiled by choice with over 50 items on the menu. It’s even got a pretty impressive menu of in-house specials alongside classics that we've all come to love. For more information or reservation enquiries, log on to the official Facebook page here. Can't get enough of tapas? Here are 5 other places we love.